A newspaper article published by The Central Florida Press on June 20, 1930. 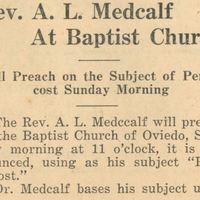 According to the article, Reverend A. L. Medcalf was slated to preach about the Pentecost at the Baptist Church of Oviedo on June 23. The end of the article appears to be cut off. The first service for the First Baptist Church was led by Reverend W. G. Powell on the property of W. H. Luther, located along Lake Jessup Avenue, in 1869. The first church building was made of wood and was located on what was the property of Lois Ruddell. The old building served the church until 1887 and later became the house of the Beasley family, which was later torn down. A new wooden church building was erected in 1887 and remained in use until 1926. Original newspaper article: "Rev. A. L. Medcalf at Baptist Church: Will Preach on the Subject of Pentecost Sunday Morning." The Central Florida Press, Vol. 1, No. 9, June 20, 1930, page 1: Oviedo Historical Society, Oviedo, Florida. Digital reproduction of original newspaper article: "Rev. A. L. Medcalf at Baptist Church: Will Preach on the Subject of Pentecost Sunday Morning." The Central Florida Press, Vol. 1, No. 9, June 20, 1930, page 1. “Rev. 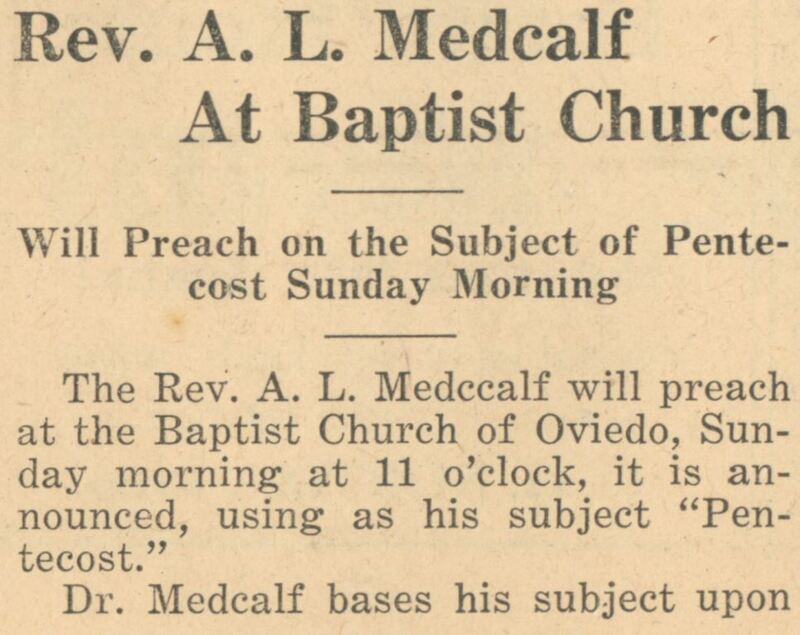 A. L. Medcalf at Baptist Church: Will Preach on the Subject of Pentecost Sunday Morning.” RICHES of Central Florida accessed April 25, 2019, https://richesmi.cah.ucf.edu/omeka/items/show/5690.